We are high in the sky, not far from Chernobyl, as the three-eyed crow flies. I am staring out of the window, wondering how a landscape so unremittingly flat and dull could be known as steppe, when lunch arrives in a lurid yellow rectangular box. 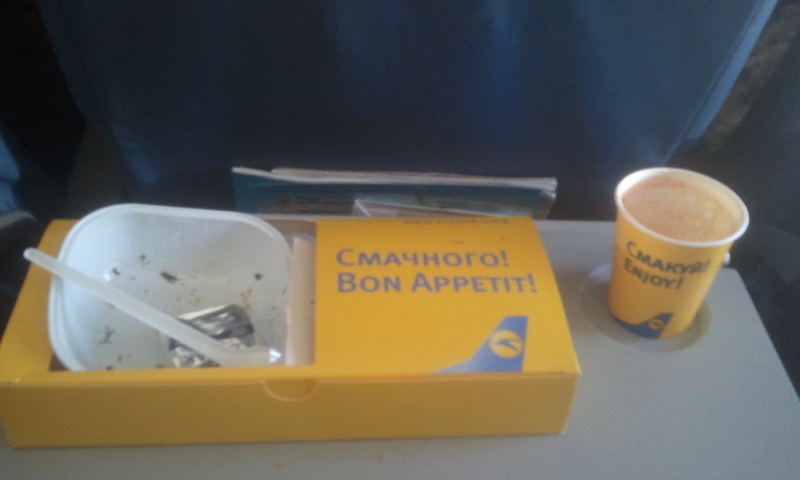 While I doubt that the presentation of food is high on the agenda of any airline’s economy class hospitality division, Ukraine International Airlines’ policy in this regard arouses immediate suspicion. One half of the top panel of the box has a viewing window cut into it, but this is of little use given that whatever it is intended to reveal is sulking in a steaming wrap of tinfoil. The contents of the other half, meanwhile, are sequestered in darkness. The airline has not presented the food badly; it has done its utmost to conceal it altogether. This is not promising. ‘Bon appétit!’ urges the box in gaudy blue lettering, while its confederate, the paper cup, chimes in with ‘Enjoy!’ I’ve a feeling that the three of us might not get on. It is clear from attempting to remove the white-hot tinfoil that the main course has just been microwaved. Some use the verb ‘to nuke’ for this method of cooking, and never has it seemed more apposite than when dining in a fallout zone. But hang on a second – isn’t tinfoil supposed to make microwaves blow up? I must be wrong. Perhaps my meal has literally been nuked: fusion cuisine. 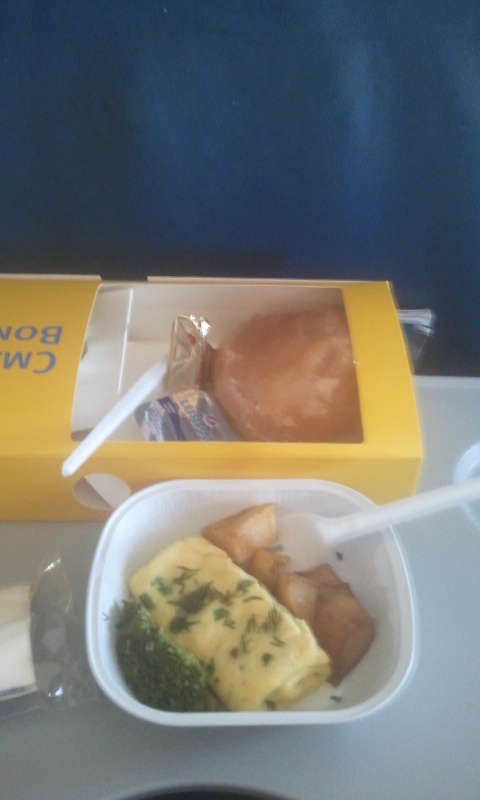 The first course bears a superficial resemblance to omelette and chips with broccoli. The portion is minuscule; several half-lives ago, presumably, it was adequate. The omelette is a homogenous mass of, who can say, rubbery-plastic or plasticky-rubber? I commit it resentfully to my stomach. It is the closest thing I have ever eaten to strange matter, the hypothetical substance of oddly uniform density that some quack scientists predicted the world would turn into if the CERN experiments were allowed to go ahead. I glance out of the window. The world looks the same as before. Scant relief. The chips are the next grim prospect, and by chips, I mean two or three wretched lumps of potato, soft and lukewarm on the outside and furiously hot and hard in the middle. Again, they bear all the hallmarks of the nuclear reactor. Unfortunately I am as hungry as an escaped convict, and I’ve been looking forward to settling down, Magwitch-like, upon my meal, but there is no pleasure to be derived from tarrying here. I bolt down the fission chips as a dog does its dinner. Once inside, they continue to seethe and burn, carbohydrate fuel rods threatening to set off a chain reaction in my stomach. The miserable floret of broccoli, meanwhile, collapses into mulch immediately upon making contact with my tongue. It is like eating a mouthful of decayed compost heap. As the first course churns away malignantly, I allow myself a glimmer of hope that the second, secreted so coyly in its cardboard lair, might be more edible or nutritious. Perhaps I can conjure a passable fruit salad or an inoffensive crème caramel from its depths. Dessert, unveil thyself! Hide not thy light under a bushel! Removing a pointless card partition, I tilt the yellow container and watch the mystery object slide reluctantly into the viewing window: a solitary bread roll, shameful in its staleness, flushed out of hiding like a dictator from his rat-hole. Surprise! I eat it out of spite. The final insult, the coup de grace, arrives with the drinks trolley. There is tomato juice, I am told, but no vodka to be had. Of all the things one might reasonably expect to be served on this airline, vodka, the national drink, daily balm and solace to millions of Ukrainians, is unavailable. If ever a stiff drink were required, it is after the farrago of horrors that I have just attempted to eat. I am ringing the bell for the burly stewardess; I need strong spirits – peasant’s moonshine, aircraft fuel, anything – or, failing that, a blunt instrument and a well-aimed blow to the back of the head.